Formally known as “Agribusiness”, Farmnation places the player in the role of a farmer setting up a new homestead trying to and make it rich. You’ll need to outsmart your opponents in crop production, land placement, and competitive plague management, to become the top farmer in the region. 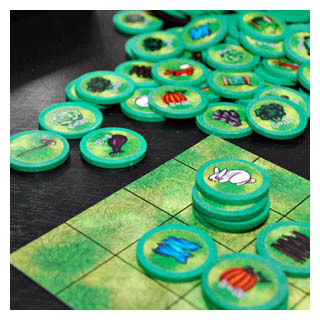 Using simple matching and placement mechanics, players plant and harvest crops to earn cash, while simultaneously playing evil bunny and bug tiles on their opponents’ farms to slow them down. As players dynamically build out their farm each game from a collection of 189 possible tiles, no two play-throughs will be the same! Perfect for your next board game party or family game night. Farmnation is simple enough for kids to learn, yet provides depth and strategic choices for adults to master. Download a copy of possible Rules Variations here. Looking for a smaller, lighter, travel sized version? Check out Farmnation Mini. Interested in Retail or Wholesale prices for Farmnation? Contact Me for bulk order info and prices.